Lloyd Kahn has done it again! 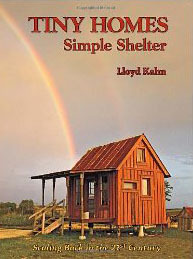 He has published another seminal work on the general topic of shelter. This one is devoted to the art of living in small spaces…in style. Tiny Homes, Simple shelter: Scaling Back in the 21st Century is another amazing book with over a thousand photos detailing more than you could ever imagine about the beauty and construction of tiny houses. By “tiny” Lloyd means no larger than 500 sq. ft., but many of them are much smaller than this. Having built and lived in many odd small structures, I can certainly appreciate the craft and utility of this approach to shelter. What I didn’t realize was the extent to which this movement has captured the imagination of common folk. Clearly the economic climate is part of the reason for this, as is the ecological realization that scaling back is often the right thing to do. Small design goes hand in hand with using recycled materials, and the result is cheap, ecological homes. There are builders across the country who are now finding a market for little buildings that can easily be hauled to any site after they have been built. Dwellers of these little homes are finding that life can be simpler when space is at a premium, partly because the temptation to buy more stuff is thwarted by the impracticality of storing it. Also, one has to become neater and more orderly about keeping things in their place; otherwise life becomes unbearable. And folks find that they actually spend more time outside, another pleasurable and healthful benefit. Lloyd has organized this colorful book into several chapters, each of which deals with the topic in a different way. There are homes that are fixed on foundations, on wheels, designed by architects or not, prefabs and kits, those made of earthy materials, treehouses, motorhomes, and even boats. The aesthetics can suit any impulse, from the funkiest of hippie hovel to high end architectural achievement. Some of these abodes are true artistic masterpieces of woodworker’s craft, and some are strictly utilitarian in style and function. Nearly all of the homes shown are described in some detail, either by the builder or the dweller, so there is personal narrative that is woven throughout the book. This makes the work inspiring on many levels; often these little homes were built by folks who have never built anything before, and become empowered by the experience of making something they can actually live in. Because these little homes can be hauled to a location or built on site with fewer materials, they are often located in spectacular places, with views and a relationship with the nature around them that is breathtaking. I applaud this movement toward living more simply and ecologically, and I applaud Lloyd Kahn for providing a totally pleasurable glimpse into this little world! I have been asked to make a presentation at a wonderful event that will be happening in the mountains of Santa Cruz, California this Fall. It is called Bonfire Heights and judging by the range of speakers and workshops planned it should be quite worthwhile and a lot of fun. Besides my presentation about "Building with Nature," others will be discussing permaculture, Occupy Wall Street, truth telling, finding the right career, building community, and more. There is an associated blog about this event and I was interviewed for this.